Organza is a thin, sheer type of fabric that has been traditionally made from silk, although nowadays organza can be made out of synthetic fibers, such as polyester and nylon. 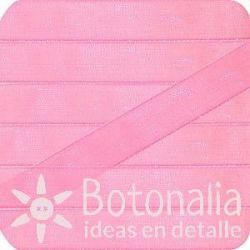 Organza ribbons sold by Botonalia are crafts quality, beautiful and shiny as the real thing, but more afordable and soft. Organza ribbon in light beige color. Collection Cupcake Boutique. Perfect for all types of crafts, ornaments, wrapping presents, etc. Manufactured by Dovecraft.Width: 10 mm.Content: 3 m.Composition: Synthetic material. Organza ribbon in hot pink. Collection Cupcake Boutique. Perfect for all types of crafts, ornaments, wrapping presents, etc. Manufactured by Dovecraft.Width: 10 mm.Content: 3 m.Composition: Synthetic material. Pink organza ribbon color. Manufactured by Dovecraft. Santoro Mirabelle Collection. Perfect for all types of crafts, ribbons, embellishments, gift wrapping, etc. Witdth: 10 mm.Content: Roll of 3 meters.Composition: Synthetic fabric. Yellow organza ribbon. Manufactured by Dovecraft. Santoro Mirabelle Collection. Perfect for all types of crafts, ribbons, embellishments, gift wrapping, etc. Witdth: 10 mm.Content: 3 meters roll.Composition: Synthetic fabric. Ocher organza ribbon. Manufactured by Dovecraft. Santoro Mirabelle Collection. Perfect for all types of crafts, ribbons, embellishments, gift wrapping, etc. Witdth: 10 mm.Content: 3 meters roll.Composition: Synthetic fabric. Golden ocher organza ribbon. Manufactured by Dovecraft. Santoro Mirabelle Collection. Perfect for all types of crafts, ribbons, embellishments, gift wrapping, etc. Witdth: 10 mm.Content: 3 meters roll.Composition: Synthetic fabric.